Affligem | Beer Apprentice - Craft Beer News, Reviews, Interviews and Info. Hello everyone. For today’s craft beer review I’m going to be drinking the Affligem 950 Cuvée produced by the Brouwerij Affligem located in Opwijk, Belgium. This beer is supposedly fairly rare here in the states and it’s been a long time since I last had a brew by Affligem, so the 950 Cuvée seemed liked the perfect brew to reintroduce myself. The website, affligembeer.be, didn’t reveal any information regarding this beer, so I’m just going to pour it and see for myself. It came in a 25.4 oz. bottle and it had an ABV of 6.8%. The pour was a good one. It was a clear, golden/orange color. The head was white, soft, sort of frothy and just a wee bit rocky. It was sized very well and the retention time was more than adequate. A solid amount of patchy lacing was left behind as the crown settled. The bouquet was quite clean and fresh as it released hints of semi-sweet bready and yeasty malts. Sturdy floral and grassy characteristics. A light pear fruitiness was discerned as well. A definite unsalted cracker or wafer type of aroma was detected too. In a lot of ways it reminded me of a Pilsner on the nose. The taste began with some very crisp and clean malts. More yeast along with white bread and crackers. Some more fruitiness was to be had in the form of pear and even a touch of light lemon. I even tasted the most subdued peppery spice also. Just a slight observance of alcohol was encountered, but it wasn’t enough to deter from the overall flavor. The mouthfeel was medium bodied. Crisp, dry, somewhat refreshing and snappy, but smooth. A minor dab of warmth was felt and the carbonation seemed to be a touch on the livelier side, but that didn’t do any harm as a noble amount of flavor was left behind on the palate for me to enjoy after each sip. Overall, I thought this was a nice beer. It wasn’t over the top, which made for a very easy and pleasant drink. It’s not the best Belgium brew that I’ve ever tried, yet it was pretty good nonetheless. It would be worth a try if you happen to run across it at your bottle shop. Like I mentioned before, it kind of reminded me of a more “upbeat” Pilsner. I think it would be well suited for any season, although I don’t know that it quite has the strength to really satisfy during the really cold days of Winter. Either way, I wouldn’t mind trying it again sometime regardless of the weather. 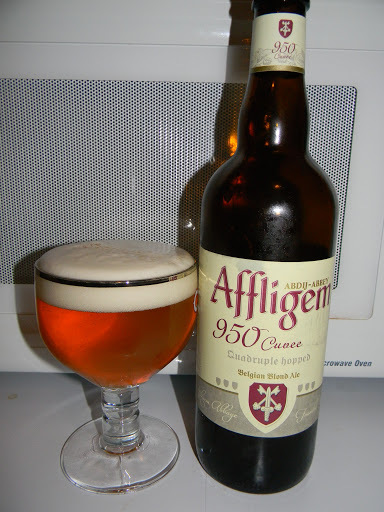 Have you guys ever tried the Affligem 950 Cuvée? What was your impression? Feel free to leave a comment if you would like. I’d love to hear from you. Hello again guys. For today’s craft beer review I’m going to be trying the Affligem Tripel produced by the Brouwerij Affligem located in Opwijk, Belgium. Now, I’ve had the opportunity to taste and review the Affligem Dubbel and the Affligem Blonde. I found both to be excellent beers, so I’m expecting this particular brew to follow along those same lines. 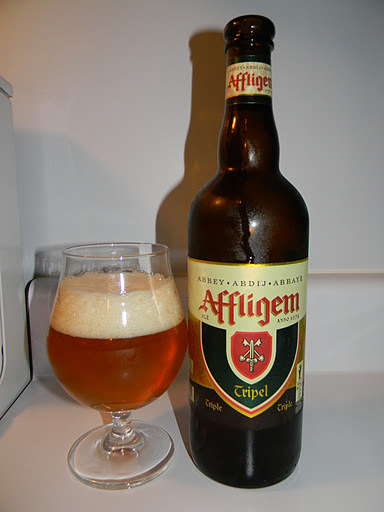 Let’s see if we can find some information about the Tripel on the website, affligembeer.be. Affligem Triple: the pride of abbey beers. Its amber colour and distinctive bitterness is bolstered by 9.5% alcohol. The Affligem Tripel comes in a 25.4 oz. bottle and it has an ABV of 9.5%. Trying to leave the sediment in the bottom of the bottle, the brew poured a very attractive, clear, honey/gold to pale orange color. The head was off white with a mostly smooth and creamy texture. It was nicely sized and the retention time was quite adequate. The lacing was just “ok”, but a thin ring stayed around the top of the beer for the majority of the drink. One cool thing I noticed was a steady stream of bubbles arising from the very center/bottom of the snifter. Very cool. The aroma was very bright with hints of spice and fruit. Tones of pepper and clove interweaved with green apples and lemon citrus. Some grassy hops and freshly shucked grain balanced the attack as well as scant cracker and wafer notes. I found the fragrance to be well harmonized, clean and fresh. It smelled good to me. Within the taste, the spices seemed to jump out at first followed quickly by the fruity lemon citrus and ripe green apples. A somewhat noticeable taste of alcohol was discovered, but it was quickly tamed by a very pleasing pepper and clove snap. It was still distinguishable, however it wasn’t too distracting because as the brew began to warm it started to become even more camouflaged by both clean, bready malts and grassy hops. The bitterness wasn’t that overpowering either, although the entire flavor profile was fairly robust and sturdy. The mouthfeel was medium bodied with some nice, bright carbonation. It was dry, clean, snappy and crisp with a slight bite. A good showing of warmth was felt from the alcohol and an acceptable amount of flavor was left covering the palate after each sip. Overall, the Affligem Tripel is a very good beer. It was solid all around. The beer is deceptively “big” however. I found it to be more of a sipper and I would probably only be able to handle one bottle at a time. Even though “spiced” brews are not a particularly favorite style of mine, I would have no problem having this again sometime in the near future. This Tripel seems to be able to blend the spices very well with the other characteristics of the flavor. Like most beers, as it began to warm it really started to shine and become much more complex and enjoyable. With that being said, if you haven’t had the opportunity to try the Affligem Tripel, pick up a bottle, enjoy it on a late night and see what you think. Be sure to let me know your opinion also. For today’s craft beer review I thought I would try the Affligem Blond produced by Brouwerij De Smedt/Brouwerij Affligem located in Opwijk, Belgium. I just recently reviewed the Affligem Dubbel and found it to be very enjoyable, so I’m hoping that I find this beer to be just as pleasing. Let’s look at the description from the website, affligembeer.be. 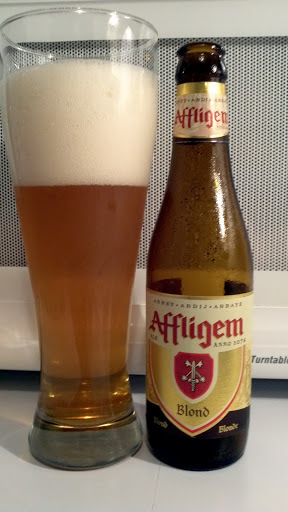 Affligem Blonde, the classic clear blonde abbey ale, with a gentle roundness and 6.8 % alcohol. Low on bitterness, it is eminently drinkable. Let’s see how it is. This beer came in an 11.2 oz. bottle and the label stated that this particular brew was 7.0% ABV. The brew poured a very clear, golden to honey color. It had a huge, billowy, soapy, white cap that had adequate retention and average lacing. The head started to crackle and pop and become somewhat fizzy as it started to subside. With the nose I detected a nice little waft of that Belgian yeast along with a moderate pepper spice. It smelled slightly fruity too with hints of light banana and maybe a faint touch of lemon citrus. Bringing up the rear was a slight fragrance of corn husk and grain. Not too bad here. It was rather pleasant and fairly complex. The taste seemed to bring out a bit more of the peppered spice than did the aroma. A very clean, grainy, yeasty backbone was detected coinciding with some of that lemon sweetness. I, personally, thought that it had a considerable bitterness. It really seemed to sparkle and tickle the tongue with each sip. The banana was almost completely hidden. Only the most faint trace was found. This taste was not bad at all. I rather enjoyed it. The mouthfeel was medium, dry, crisp, refreshing and thirst quenching. Very nice carbonation for such a crisp and clean beer. A decent dose of flavor was left behind after each sip too. Overall, I thought this was a pretty good Blonde. This would totally hit the spot during the warmer days of Spring or Summer. It’s easily drinkable and refreshing for a 7.0% ABV beer. I found myself taking huge gulps, which made for a very enjoyable and quick drinking experience. I would most definitely recommend you give this a go if you have not tried it or if you favor Blonde’s. I’m sure I will seek this out again next Summer and pair it with a day at the BBQ grill. Do you guys favor Blonde’s during the Summer or do you prefer something else? Feel free to leave a comment if you wish. Thanks for reading everyone. Until next time.